Discussion in 'Overclocking & Cooling' started by Nightfire, Mar 9, 2018. First I started stock. 3.6 ghz cpu, 1.2 ghz GPU, and ram at 2400 cas 16. 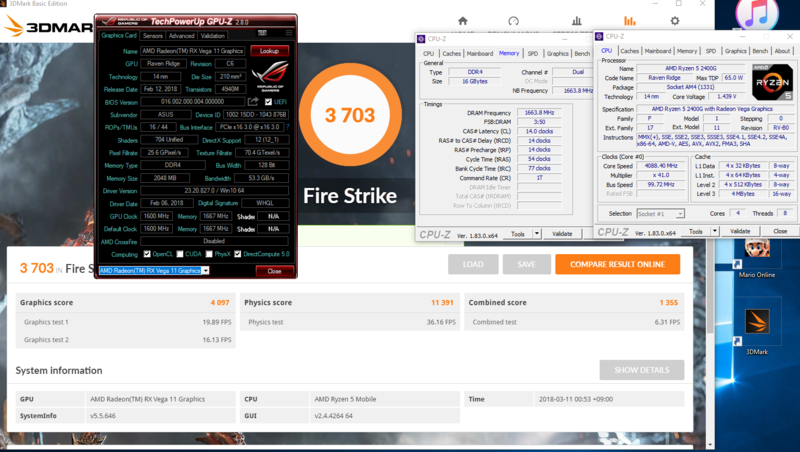 Results were better than any of the previous overclocked apus as expected. I started by swing what I could run without increasing voltage. I did however adjust LLC to high. The CPU booted no problem at 3.9 ghz. I didn't even try higher yet. I just wanted to start with a good 24/7 oc. For the you, the bios had an 'extreme' preset of 1500 mhz. It wasn't very stable so I dialed back to 1400 mhz. For the 16gb of flare-x, I set it at the 3200 cas 14 rating. The score increases were not as high as I had hoped. Not shown is Cinebench which got right at 800. Hitting my goal of 900 may be very tough. I increased the fan on the H80i and it did well. The max voltage only increased slightly. Timespy is definitely brutal on APUs. 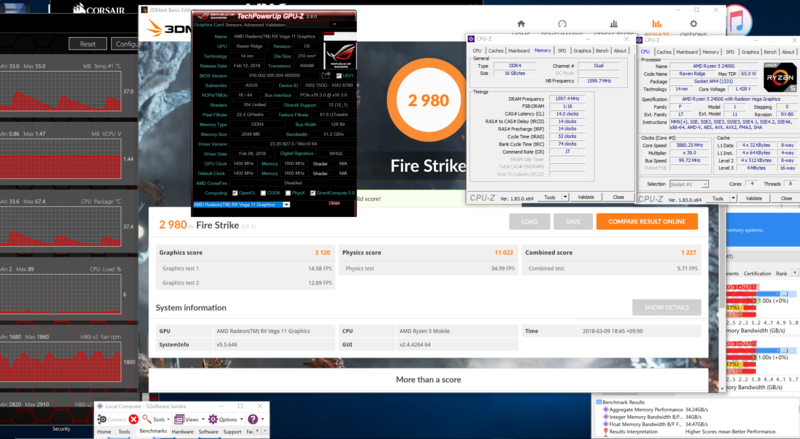 It seems to max the CPU with the gpu much more than Firestrike. It had max temps over 10* higher! From here I will mess with one component at a time: gpu, cpu, and ram. So I got to overclocking with the bios. First off, leaving voltages on auto is a BAD idea. I saw spikes of over 1.5v! Getting 4.0 thx was child's play. 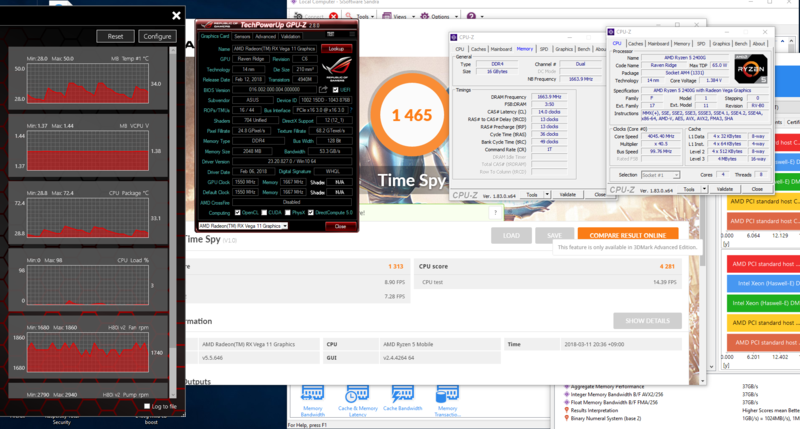 It really ramps up after that so I stopped at 4.1 ghz. I will dial back to 4.0 ghz. Memory was probably the most disappointing. I really wanted at least 3466 mhz, but even with 1.45 v, 1.25v soc, and high timings, it would not post. I had to 'settle' for 3333mhz cas14. This was very staple at 1.39v. Anyhow, I can't complain with a $100 TUF ASUS. I was able to get 1600 mhz working on the gpu, which was my goal. It took ALOT more voltage than 1550 mhz so I would dial it back when not benching. didnt everyone say to keep SOC under 1.2v or it will damage it? This was just for benching fun and not long term. I am going to turn down the gpu and cpu down a notch and run again at the minimum stable voltage. I should be able to drop the volts ALOT as 4.0 cpu and 1560 mhz gpu is where the wall began. 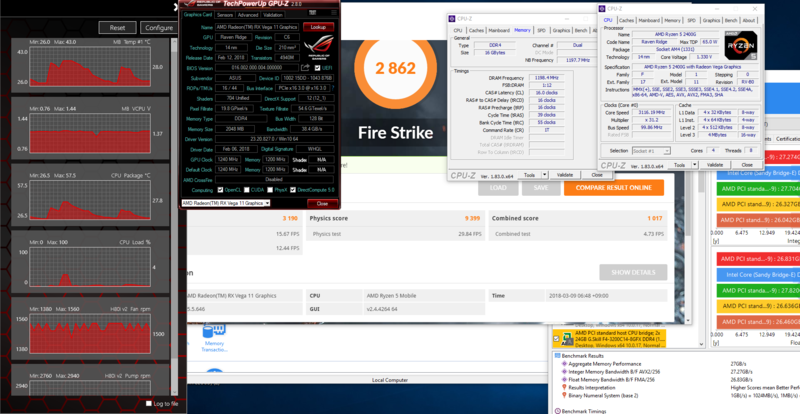 I am a bit disappointed in my Cinebench score of 852 at 4.1 ghz. I was expecting to hit 900 points at that speed. It maxed at 63* with 1800rpm meaning I could have ran it at near silent levels and be under the thermal limit. Firestrike liked the tighter timings even more than Timespy. 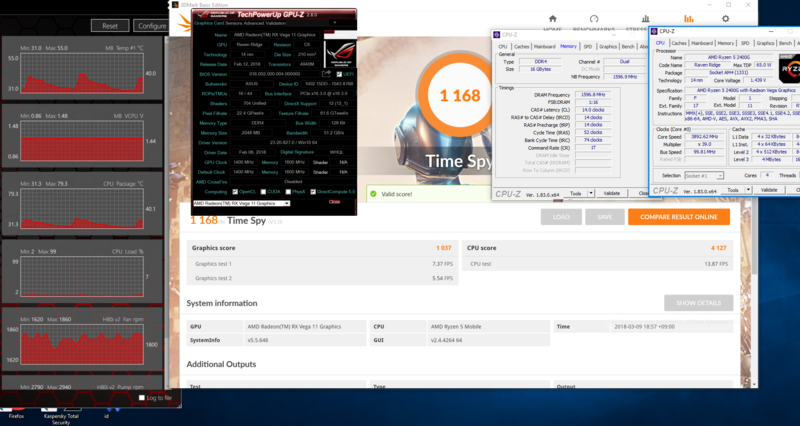 the 4.05ghz/1550mhz gpu combo managed to beat the 4.1 ghz/1600mhz gpu run. Nery nice! Right off the bat he manages about 200 points higher than me on graphics and combined score on stock settings. Same goes for when we have similar overclocks as I am never able to hit 4000 points combined. 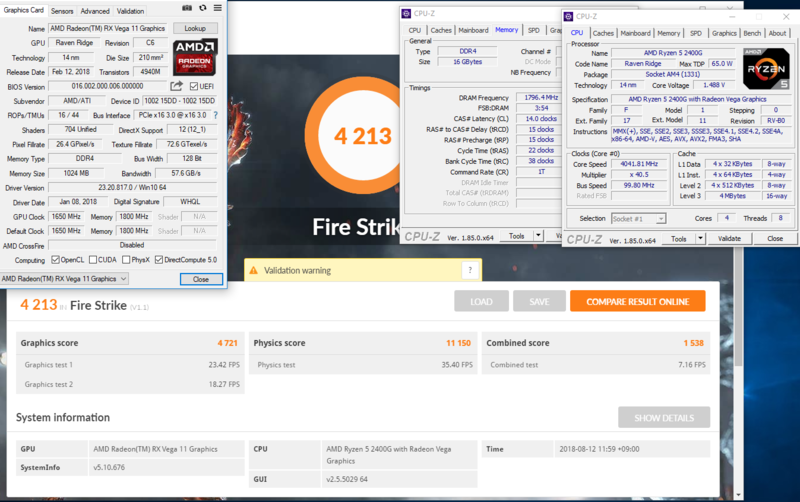 I even tried it with my current AB350 ITX ASRock and still had similar stock scores as my TUF B-350. I am currently using an ASROCK as my ASUS TUF died on me. I have since delided and would have liked to give it another shot. Unfortunately, the ASRock boards do not support iGPU overclocking. Buildzoid mentions that Gigabyte memory settings are not great. MSI limits the iGPU to around 1500 MHz in Ryzen master and is not even supported in the newest BIOS. So if you are building an APU setup, GET AN ASUS BOARD or at the very least Gigabyte. 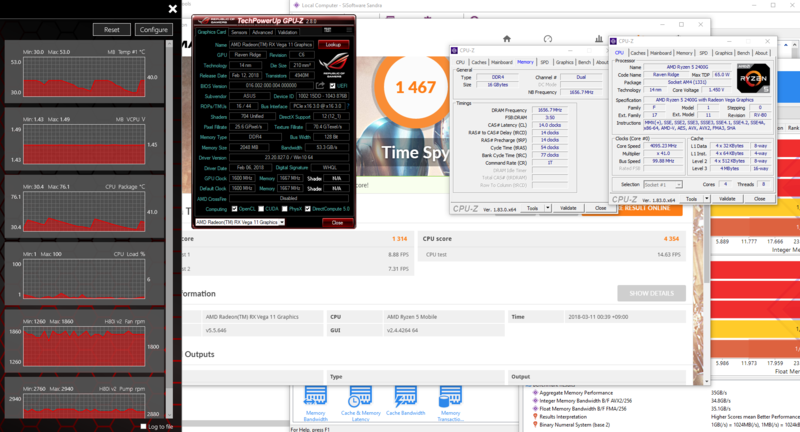 The only advantage that my ASrock B350 has over my ASUS B350 is that I can run at 3466 MHZ ram. With 1.5v, I would probably be stable with 3600 mhz. Buildzoid gives confidence in running that voltage, so I might give it a try. The ASUS refused to boot above 3333 MHZ regardless of voltage. So if you are building a normal Ryzen ITX, ASRock may actually be best. This time I was smarter about it and ran it with higher affinity and on a 1080p screen. Even still, Buildzoid is still a good bit higher with similiar settings. Secondary settings are good on mine and only help so much. Also, my trfc is 256, which is very low. Yeah, I don't see why everyone focuses on oc'ing the CPU side of these things, When you can dump all of the effort and voltage into making he GPU side sing. Increasing the CPU speed isn't going to get you jack when you're being tied down by an 11 core radeon GPU: OC'ing the balls off the GPU seems like the best way to get the most performance per-dollar. These APUs are very complex. If you can overclock these things you can overclock about anything. It is not as simple as more is better. Too much SOC voltage and the ram is unstable. Also the vrm temps will get too high for a stable gpu overclock. Too little soc voltage and and the gpu will be unstable as well. There is also a seperate gpu voltage to throw in the mix. Actually kind of fun if you have the time. Probably want to up that to 2GB in the BIOS. The new bios allows this to be changed, but I then need to use the CBS settings, which makes overclocking even more complex. Honestly, it does not matter with the shared memory pool. Only when you allocate less than 512 mb is there any issue. The new bios actually allows you to allocate 4gb or more if I remember correct. This would be kind of stupid as that ram would now be totally unuseable for normal system use. Alright, make that the 4200 club. I managed to squeeze a bit more out of my memory. Ryzen is all about memory speed! I actually had a successful run with 1675mhz on the GPU. MORE IMPORTANTLY. The motherboard pushes SOC voltage past 1.4v if you attempt this. it doesn't matter what the bios settings are. This was repeatable and showed up several times in RTC. I am not sure if this is some type of bug. Voltage for the GPU was about 1.34v and the SOC was just under 1.8v. This memory controller really hates too much voltage. You want just enough SOC voltage to stabilize the gpu overclock. Over stock settings, I have about a 45% increase in performance. This is right between the 50% increase in memory speed and 33% increase in gpu speed.